Coconut Meal? My Horse Won’t Eat That! I get some version of this response (title of article) just about every time I strike up a conversation with someone new about Cool Stance. But, the truth is, I have yet to meet a horse that hasn’t readily accepted it when transitioned thoughtfully. It’s true that a horse accustomed to eating grains high in starch and sugars is likely to turn its nose up at Cool Stance if you suddenly replace his usual sinful dinner with a bowl of healthy coconut meal (the same could be said about most of us as well!). 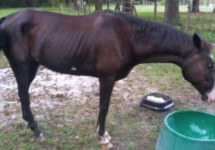 But, the fact of the matter is, no one should ever transition any horse from one type of feed to another abruptly. Also, if you’ve ever had a loose horse on your farm or in your barn, you know that when it comes to choosing what (or how much) to eat, horses definitely don’t always know what’s best for them! Stance Equine USA offers a recommended protocol for introducing Cool Stance, but I don’t want you to just take the company’s word for it. 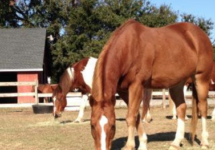 So in this article, I’m going to share some personal stories of how several of my friends and I have successfully transitioned a variety of horses over to Cool Stance, with amazing results. Left: Robin and Hardy Brown with their horses, Dahlia and Chip. 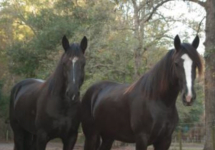 First I want to introduce you to Robin and Hardy Brown who own Chainey Briar Stables in Ridgeville, SC. The Browns were so excited about the early results they got from Cool Stance back in 2011 that they stepped up as the very first dealers in the Southeast! 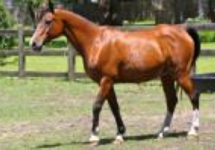 “Since we are a boarding stable, we have transitioned a number of horses of many breeds, backgrounds and diets over to Cool Stance, usually with minimal to no resistance”, explains Hardy. “With new horses, we start with just a sprinkle or about 1/8 cup of dry Cool Stance on their current food. Some horses will do some sniffing or pushing the food around with their upper lip, and one or two horses have tried eating around it, but typically within a couple of days they finish everything.” Hardy goes on to explain that over the next few days they gradually add more Cool Stance up to about 1/2 a cup, and then introduce some moisture to get the horses used to eating wet feed. Usually within three weeks they are completely switched over to the appropriate amount for each particular horse’s needs, which could be anywhere from 1.5 to 5 cups of Cool Stance, twice per day. Many people are concerned initially with the fat content in Cool Stance (9%). But what those of us who use the feed have found is that because coconut meal contains only medium-chain triglycerides, you get all the benefits of a healthy oil (enhanced coat color and condition for example), without adding unwanted weight. And because Cool Stance is packed full of readily digestible protein (20%), you also get improved muscle tone and top-lines. 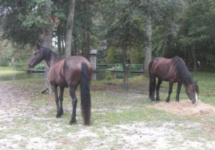 Kit and Val, both Georgian Grande horses (a cross between a Saddlebred and a Friesian) who are owned by Michael Zeigler,were boarded at Chainey Briar Stables from 2008 until 2014. As you can see from the photos on the left, they are a perfect example of the positive changes we frequently see in coat condition/color and top-line! My own Arabian gelding, Shoki, is further proof that the fats in Cool Stance are safe and effective, even for “easy keepers”. For many years I struggled to control emerging metabolic issues with Shoki. He was considerably overweight and had started to develop a cresty neck and fat pads behind his shoulders. My veterinarian was quite concerned about his weight. I had already tried a variety of “low starch” commercial feeds and had increased his exercise, all to no avail. So, I was excited when I learned that Cool Stance contains no more than 11% non- structural carbohydrates (NSC) and no more than 2% starch! 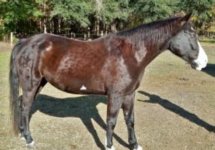 As you can see from the photos below (click on images to enlarge), after transitioning to Cool Stance Shoki dropped considerable weight and his cresty neck line disappeared, but he still maintained excellent overall body and coat condition. The last photo on the right shows him earlier this year, at age 26 and completely retired – but still fit and maintaining wonderful muscle tone on Cool Stance. Cool Stance is also very effective at putting weight on Meet Jett, a 7 year old paint gelding owned by Lauren Clarey. 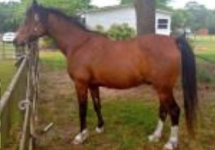 Jett recently came to Chainey Briar Stables as a ne wboarder,arrivingonSeptember17,2016. He was immediately transitioned over to Cool Stance. You can see from the before and after photos below that Jett’s body and coat condition have both drastically improved in just 2 months. We’re all excited to see how phenomenal he’ll look when he sheds out next Spring! Providing 1630 calories/lb of digestible energy, Cool Stance is also an excellent feed for performance horses that need readily available “cool” energy that won’t make them hot or “fizzy”. I hope you’ve enjoyed these stories. And, I hope you will share this article freely with others who might be interested in the benefits of this highly versatile, naturally GMO free, forage-based feed! Perhaps the information here will provide the motivation and reassurance more owners or trainers need in order to give this phenomenal feed a shot with their own horses. If so, I hope they’ll share their success stories with me! 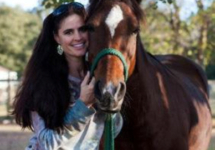 Kim Hallin is an accomplished horse trainer specializing in humane methods that uphold the integrity of the horse. She loves to nurture the powerful bonds that can develop between people and animals. 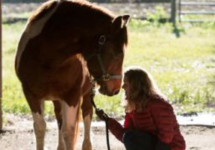 Kim recently launched Unbridled LLC, a business that brings humans and horses together in a collaborative learning process designed to enhance leadership and communication skills while developing greater overall self- awareness. Kim just joined our small team at Stance Equine USA as the Creative Director. 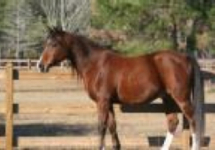 To learn more about Kim, please go to www.unbridled.guru. 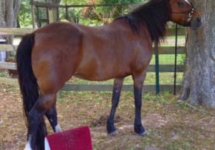 My horse has been on cool stance now since February 1, 2019 So about 3 weeks. I make it a mash but all of a sudden she is not eating it at all anymore. I’m having to dump it before it sours. What would you do? Try feeding it dry. It does usually not sour for quite a while, but if you feed it dry, you can always take it away after a while and try again. Maybe also try a lesser amount.